Whiskey is a 12 year old Quarter Horse gelding with a history of right forelimb lameness due to poor hoof care and conformation and exercise induced pulmonary hemorrhage. He is used for barrel racing and is fairly competitive, going to races about twice monthly. The goal of treatment for Whiskey is to address any developing muscle soreness, maintain lung health, and improve performance. Whiskey’s owner is happy with his response to acupuncture and tries to schedule an appointment about 3 days before each race and about every 2 weeks for maintenance. Whiskey is a 12 year old Quarter Horse gelding in heavy work as a barrel racer. Whiskey raced in his futurity years, then was gelded and not worked for many years with a previous owner. He has a history of right forelimb lameness due to poor hoof care, left rear lameness originating in the hock, and exercise induced pulmonary hemorrhage. For maintenance during racing season, Whiskey is seen by a chiropractor about every 3 months, gets Legend intramuscularly, occasionally (about yearly) has his left hock injected, and wears a magnetic blanket after hard workouts and races. Before every race, he also gets furosemide intravenously and albuterol breathing treatments. Temperature, pulse and respiration all within normal limits for all exams. Neurologic exam normal for all exams. Whiskey was resistant to extending right forelimb forward with carpus at 90 degrees and was moderately painful on palpation of C3-5 especially on the left. Medial effusion present in left hock without pain on palpation. He was sluggish to pick up left hind foot and didn’t lift it up as far as right. He was painful on palpation of inner bladder line bilaterally, but worst on left at BL 23-25; and, tender to palpation of the heave line bilaterally. On gate analysis, he was short-strided in the right front with a head-bob when circling to the right and was consistently short-strided especially on the cranial phase of the gate. Whiskey had an occasional productive cough with moderate sensitivity over C5, worse on the right. Per owner, he was out in the arena running and bucking 2 days before and she believes he hurt his neck at that time. He was also moderately painful on palpation of the deltoid on right with many trigger points extending dorsally. 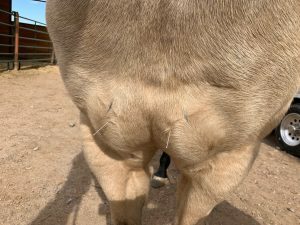 He was minimally painful to palpation of the bladder line in mid-lumbar region and was non-painful to palpation of the left gluteal and semimembranosus which are great improvements. Moderately responsive to palpation of the “heave line” (abdominal myofascial transition) and on questioning the owner, she has been working on collection, requiring him to move using more abdominal muscles. At this exam, Whiskey had been seen by the chiropractor 3 days previously. He had been getting more and more tight in his front end, per owner, after switching to a different cinch. Whiskey was switched back to his original cinch and was moving better at this time. However, Whiskey had many tight bands throughout his deltoid, supraspinatus, and infraspinatus muscles on both sides, worse on the right. His neck and mid-lumbar regions which had previously been painful were significantly improved. He has minimal medial effusion of his left hock, but his gate analysis in the hind was normal. When we was trotted, he seemed to tense his caudal neck and was short-strided bilaterally in the front. In addition, he was very uncomfortable when trying to assess mobility of the scapula, especially on the left. 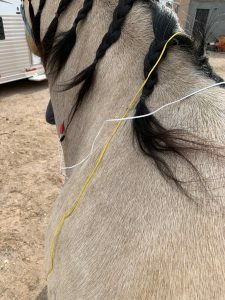 Due to Whiskey’s positive reaction to his first acupuncture treatment, an electrical stimulation unit and uncoated needles were used on later treatments. Whiskey also seems particularly sensitive to musculoskeletal pain, his gate alters significantly and this severely affects his performance according to his owner. Because of these things, the goal of treatment is to address his continuing underlying issues (bronchitis, right forelimb abnormalities, and left hock pain) and his performance injuries that develop as training progresses. Points were selected based on sensitivity to palpation, mostly to address continually changing muscle soreness due to being in heavy work but also compensatory strain patterns that develop due to faults in conformation and assumed past injuries. Treatments were done about 3 days before competitions to (hopefully) maximize performance on that day. As treatments progress, the owner feels that every other week and 2-3 days before competitions are the best thing to keep Whiskey on track. Sometimes, he is too sensitive for electrical stimulation or needles especially on his back, so we use the MR4 Activet laser on program 2 (5 Hz for 5 minutes). 12/20/18- All needles placed are Seirin 0.2x25mm unless otherwise noted. Carbo 0.2x35mm was placed in the trigger point in the left brachiocephalicus muscle. GV 20, GV 14, and Bai Hui were placed to evaluate Whiskey’s response to needles and start the treatment. GB 21, LI 16, BL 23 (Seirin 0.25x30mm) and 25 (Seirin 0.25x30mm) were placed bilaterally to address tight bands and pain on palpation. LI 15, TH 14, PC 6, BL 13, BL 14, and BL 15 were placed on the right to address right forelimb myofascial dysfunction. BL 40 and ST 36 were placed on the left to address left rear pain on palpation and lameness. 1/4/19- All needles placed are Carbo 0.2x30mm unless otherwise noted. GV 20, GV 14, and Bai Hui were placed to start the treatment. BL 23 and GB 21 were placed bilaterally to address myofascial dysfunction. Ito ES-130 at 170 Hz was placed bilaterally along brachiocephalicus from cervical vertebral space 4-5 to 5-6 to address myofascial pain. LU 1 was placed bilaterally for lung support. A Seirin 0.2x30mm was placed in the right deltoid trigger point after significant massage and palpation. Right PC 6 and ting points with Carbo 0.16x30mm were placed for right forelimb support. 1/10/19- All needles placed are Carbo 0.2x30mm unless otherwise noted. GV 20, GV 14, and Bai Hui were placed to start the treatment. GB 21, LI 15, TH 14, and PC 6 were placed on the right to address right forelimb lameness and shoulder myofascial dysfunction. Right ting points using Seirin 0.16×15 were placed for 5min to support the right forelimb. The MR4 Activet laser on program 2 (5Hz for 5 min) was used on the right deltoid and dorsoscapular area. LU 1, SI 11 and 12, BL 23, BL 40, TH 15, BL 11, BL 12, and BL 13 were placed bilaterally to address lung congestion, shoulder pain, and compensatory myofascial dysfunction. ST 36 was placed on the left to address compensatory myofascial dysfunction. Whiskey was a good learning case due to his positive response to acupuncture. He became very sedate during treatments with immediate change in gate. He continues to improve in competition, but that would be expected with or without acupuncture due to training. 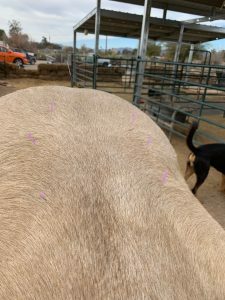 The most improvement I appreciated between treatments were in back pain and consistency in gate; before acupuncture he would be off-and-on lame and now his biggest change is in length of stride but he has stayed sound. Whiskey is a very sensitive and opinionated patient, so I learned quickly to watch closely for signs that he was close to being done and to pull the needles before he became impatient. Denoix, J. (2017). Diagnosis of Low Back (Lumbar and Lumbosacral) Pain in Equine Athletes. In ACVIM. Goustranville, France.